Born in Belgaum, Karnataka. 1930-33 Painted signboards and billboards. 1942 Joined Quit India Movement. 1947 Founder President, Delhi Silpi Chakra, New Delhi. 1947-48 Member of Governing Council, AIFACS, New Delhi. Founder of Triveni Kala Sangam, New Delhi. 1948-52 Secretary, AIFACS, New Delhi. 1949-68 Director, Art Department, Triveni Kala Sangam, New Delhi. 1950 Jury member, Shankers International Children art Competitions, New Delhi. 1950 Represented India at International Arts Program, sponsored by State Department and JDR 3rd Foundation, USA. 1962 Member of General Council, Lalit Kala Akademi, New Delhi. 1972-78 Chairman, Lalit Kala Akademi, Lucknow. 1973-78 Vice-Chairman, Lalit Kala Akademi, New Delhi. Received Mural Decoration Scholarship, Govt. of India. 1935-40 Diploma in Fine Arts, J.J. School of Art, Bombay. 1941-42 Post graduation, J.J. School of Art, Bombay. 1941-43 Research Scholar, Tata Trust for Indian painting. 1945 International Art Exhb., New Delhi. 1945 Solo exhb., AIFACS, New Delhi. 1949 International Art Exhb., London. 1951 Exhb., Arthur Newton Gallery, New York. 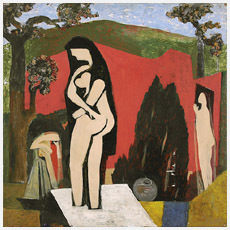 1952, 55, 59, 61, 62 Exhb., Kumar Gallery, New Delhi. 1953 Group exhb. organised by Silpi Chakra, Free Mansion Hall, New Delhi. 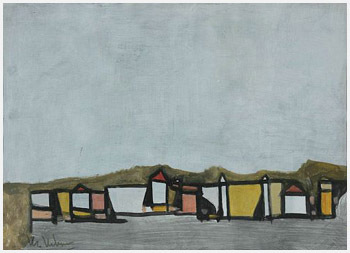 1954, 55, 57, 59 Exhb., Silpa Chakra Art Gallery, New Delhi. 1957-58 Exhb., Franz Bodair Gallery, Washington. 1958 Exhb., Atelier Art Gallery, Kahira. 1958 Exhb., Batumal Foundation, Honolulu. 1958 Exhb., Danber Gallery, New York. 1959 Exhb., World House Gallery, New York. 1959 Exhb., Modern Art Centre, Zurich. 1959 Exhb., Antonio Soja Gallery, Mexico. 1959 Sao Paulo Biennale, Brazil. 1959 Indian Painter, organised by East Europe Federation of Arts, USA. 1968 Exhb., Max Mueller Bhavan, New Delhi. 1970 Saratoga Springs Chamber of Commerce, New York. 1947 Bronze Medal, International Exhb., London. 1955, 62, 65 National Award, Lalit Kala Akademi, New Delhi. 1982 Fellow, Lalit Kala Akademi, New Delhi. 1945-50, 52-58, 59-61 Visiting Professor, Art Department, Delhi Polytechnic, New Delhi. 1950-55 Visiting Faculty, School of Planning and Architecture, New Delhi. 1972-78 Dean, Faculty of Music and Fine Arts, Benaras Hindu University, Benaras.